Holiday Card Sayings | May Your Christmas Days Be Merry! Owing to the fact that holidays are not monotonous in tone and theme, our greetings to loved ones during these occasions should also lavishly display some assortment. Below are some cool sayings set to different events and moods that you can use in a variety of celebratory settings during the holidays! Include any of these messages in your holiday cards and add more color and excitement to it. May your holiday season be filled with friends, family and of course all of the booze you can reasonably afford. I’m feeling so good this holiday season that I even wish my ex-girlfriend to have a good time! This holiday season can’t officially end unless I see you, so take your time in coming over so I have a reason to delay in returning to work. We all dearly hope to see your face during this holiday season so that we will really have a reason to count our blessings. If you don’t come over this holiday season, when I get drunk I’m going to have to chat with imaginary friends instead. We wanted to incorporate your presence so thoroughly into this holiday that we’ve decided to let you buy all of the presents. May this Christmas bring you all of the joy of not having to deal with us again until New Year’s. During this generous Christmas, may the price of the gift you buy for me be multiplied by two into your bank account. 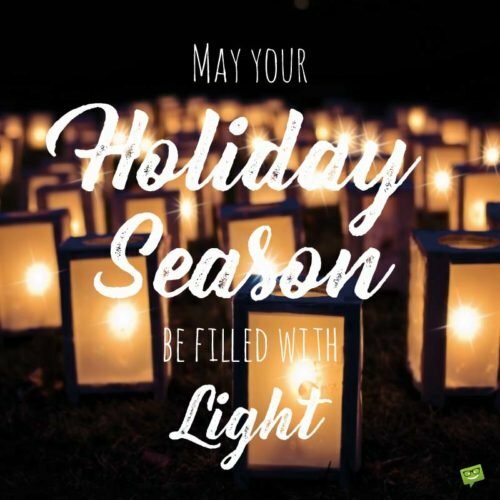 May your Holiday Season be filled with Light. I hope that Santa Claus doesn’t get stuck in your gas pipe again this year. Merry Christmas. I love you more than Santa because I’m giving you this Christmas gift even though you’ve been naughty! May this holiday get you so fat that if you wore a fur coat people would think you’re a bear. This Christmas I’m gifting everyone a box of toffees to interact with the aftertaste of that holiday dinner you love cooking so much. Merry Christmas, and may even the holidays bring you a positive cash flow that grows into the future and beyond. May you become so fat this Christmas that if you put on a red hat people would think you’re Santa Claus. Happy holidays! I wish you, your family and all of your friends and associates an incredibly wonderful holiday season. May all of your joyous expectations for you and your loved ones be fulfilled this holiday season. A holiday without you doesn’t feel like a celebration at all, so I very much hope you are able to visit over during this one. During this season, I want us all to remember what this holiday truly represents and make an honest attempt to fashion our lives hereafter accordingly. Happy holidays, and I hope we have the opportunity to meet and spend time together before the end of this joyous season! Wishing you joy and peace this holiday season. May your home be illuminated with the lights of a vibrant Christmas tree and the joyous hymns of a merry family. 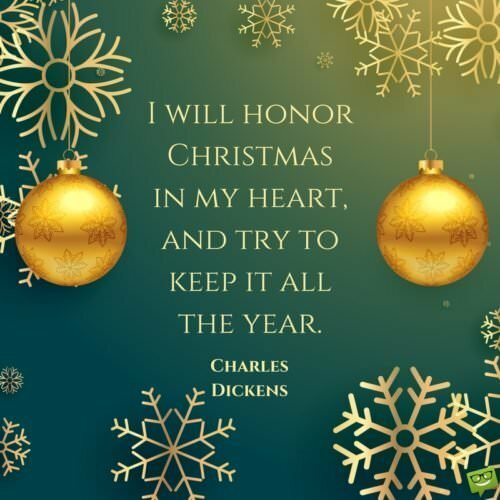 I hope you have a family-oriented Christmas worthy of the traditions of our forefathers. It is a time-honored tradition in my family to invite all loved ones over for Christmas dinner, and as such, I would like to extend this invitation to you and your family. May you experience every delight that that dwells in this beautiful season. Happy holiday. Holidays are more about celebrating people like you in our lives than they are about keeping tradition. Every holiday worth its salt is based on the concept of loving your neighbor, so please accept this humble yet sincere gift from me and my family. I believe this holiday season is the beginning of a new era in your life full of joy and prosperity. May all of your tears and internal conflicts be turned into laughter and inner peace during this holiday. May this holiday season remind you that giving up on your dreams will act as a disservice to your entire family and mankind, for you were born to be nothing short of great. Where others may just derive meaningless joy from this holiday season, I hope you are able to use it as an impetus to push even harder towards your goals going into the future. You’re phenomenal, my dear. This year, I would like you to join me for charity work down at the shelter so that I can show you the true meaning of Christmas! 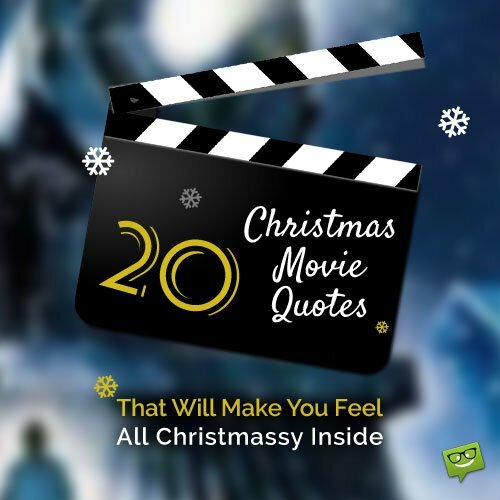 I hope that you have a Christmas season fitting of someone who is about to embark on his most successful year yet! Holidays like these are to remind us that it is always preferably to focus on our blessings rather than our discontents. May this holiday season remind you of how special you are to my universe. Thanks for being a reliable source of inspiration and joy to me. Happy holidays. I am thankful to you for being a friend, which is why I was compelled to send you this holiday greeting. It is during these times that I am not only most thankful for life but also for having someone like you in it. Happy holidays. None of us are promised tomorrow, and as such we should be thankful for the privilege of spending yet another holiday season in each other’s company. I am thankful not only to see another holiday but also for the priceless opportunity to share such an occasion with the people that I truly love. I am grateful to the Almighty for not only bringing us together this holiday season but for keeping us all in good health and putting joy in our hearts. A holiday is not worth celebrating if it does not involve being grateful for the special people like you in my life. This Christmas I would like us all not to meditate on anything stressful but rather focus on the various blessings received throughout the year. During the holidays I am more thankful for the people who love me than for the material gifts they present. I can’t thank God enough for blessing me and my loved ones with another beautiful holiday season. It’s such a great blessing to be alive and healthy. I am grateful not only for this holiday with you but also for the glorious future that lies ahead of us. I am thankfully extending these holiday greetings to you, knowing that we both are in health, wealth and happiness. This holiday season my gratitude not only extends up to Heaven but also to the family and friends I have here on Earth who make this life one I enjoy living.